JDF (the husband) and CMF (the wife) separated in 2000, and proceedings in relation to their divorce have been in the courts since 2002. In the High Court in January 2013, Mr Justice Henry Abbott granted a divorce and made a number of orders regarding their financial relationship. In the Supreme Court, Mr Justice MacMenamin considered two notices of appeal against the judgment and orders made by Mr Justice Abbott. The first appeal was in relation to the apportionment of the husband’s pension fund, which the husband contended was over-generous to the wife and did not make proper provision for him. The second appeal was a complaint about the pension administrators and trustees, which the husband said were inefficient and needlessly incurred exorbitant costs in the process of assisting the court. In the High Court, Mr Justice Abbott made a Pensions Adjustment Order under s.17(2) of the Family Law (Divorce) Act 1996, awarding the wife 80% of the husband’s pension fund, and 20% to the husband. The pension fund was estimated to have a net value of approximately €800,000. The husband appealed the order, contending that it did not make proper provision for him. The wife said that it made proper provision for both parties. Mr Justice MacMenamin said that under the Family Law (Divorce) Act 1996, the Court has to balance the respective rights, duties, obligations and circumstances of each of the parties, and the duty of the Court was to make “proper provision” for the defendant spouse, having regard to the circumstances. It was explained that the husband lived with his daughter in a house he inherited from his father, attached to the small stud farm on which he has a small horse-breeding operation. Prior to this, he worked in finance and the pension was from this previous employment. Under the terms of his father’s will, the husband is entitled to a life interest in the home which would thereafter go to other male members of the family. As such, Mr Justice MacMenamin was satisfied that the husband had lifetime accommodation available to him, and a source of income which was estimated at €33,000 per year. The husband contended that he had debts in the region of €600,000, and that the wife had already benefited from €500,000 in lump sums, including a drawdown of €222,000 from the pension fund in 2013. He also contended that the wife would inherit property from her mother to the value of €1 million. The wife was said to be living abroad and sought to move back to Ireland to be closer to her children, but that she had no assets or home. She informed the court that she did not have an income, and that the majority of the monies she received from previous court orders went towards legal fees in relation to the divorce. Mr Justice MacMenamin said that the financial circumstances of both parties had significantly worsened since 2013, but he considered the wife’s situation to have deteriorated more. He said that it was not entirely clear how Mr Justice Abbott had arrived at the apportionment of 80% of the pension fund to the wife and 20% to the husband, but that little would be gained by remitting the case to the High Court. Considering the fact that the wife had no income, no home, and faced an uncertain future; Mr Justice MacMenamin directed that the wife should receive 75% of the balance of the pension fund, and the husband 25%. The husband complained that the pension administrators and trustees were inefficient and needlessly incurred exorbitant costs in the process of assisting the courts as to how monies could be released from the fund for the purposes of making a pension adjustment order. He said that if the trustees and administrators of the scheme had followed the advice of one official in Mercers, there would not have been any difficulty regarding the realisation of the assets in the Fund – and that the costs accrued as a result of these efforts were unnecessary. The husband complained that the trustees and administrators unnecessarily set about making a transfer of 50% of the entire funds on two separate occasions, but that he subsequently applied to court to prevent this. He says the matter was appealed to the Supreme Court. In particular, he complained that one representative of the trustees attended the Supreme Court, and charged a total of €15,790 for one day. Mr Justice MacMenamin said that since the trustees were not put on notice of the date of this appeal, or that their costs were going to be challenged, it was unnecessary to go into detail. He said that whatever sympathy one might feel in relation to these costs, it would not have been possible to make the pension adjustment orders in the absence of information from them. Agreeing with Mr Justice Abbott’s proposition that the matter of these costs might be dealt with by the Pensions Ombudsman, Mr Justice MacMenamin said that the Court could not play a role in questioning the costs incurred. Mr Justice MacMenamin said that the Court registrar had received correspondence from both the husband and wife subsequent to the hearing and said that this was not appropriate. 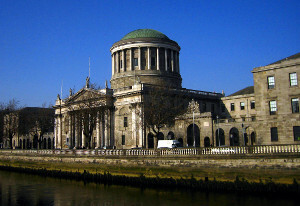 Mr Justice MacMenamin added that he hoped, after the years of litigation and hundreds of thousands of Euro in legal costs, the case would now end.